Background and objectives Radiographic calcification and arterial stiffness each individually are predictive of outcome in dialysis patients. However, it is unknown whether combined assessment of these intermediate endpoints also provides additional predictive value. Design, setting, participants, & measurements Scoring of abdominal aortic calcification (AAC) using plain lateral abdominal x-ray and measurement of carotid-femoral pulse wave velocity (PWV) were performed in a cohort of 1084 prevalent dialysis patients recruited from 47 European dialysis centers. Results During a follow-up of 2 years, 234 deaths and 91 nonfatal cardiovascular (CV) events occurred. Compared with the lowest tertile of AAC, the risk of an event was increased by a factor 3.7 in patients with a score of 5 to 15 (middle tertile), and by a factor 8.6 in patients with scores of 16 to 24. Additionally, each 1-m/s increase in PWV was associated with a 15% higher risk. At higher AAC (scores ≥5), the effect of PWV was attenuated because of a negative PWV × AAC interaction (hazard ratio [HR]: 0.895 and 0.865 for middle and upper AAC tertiles). After accounting for age, diabetes, and serum albumin, AAC and PWV remained independent predictors of outcome. Conclusions AAC and central arterial stiffness are independent predictors of mortality and nonfatal CV events in dialysis patients. The risk associated with an increased PWV is less pronounced at higher levels of calcification. Assessment of AAC and PWV is feasible in a clinical setting and both may be used for an accurate CV risk estimation in this heterogeneous population. Over the past decade, vascular calcification and stiffening of the central elastic-type arteries have been shown to be independent predictors of cardiovascular (CV) morbidity and mortality in patients with chronic kidney disease on dialysis (1,2). Animal studies suggest that disturbances of bone and mineral metabolism play a major role in the initiation and progression of medial wall calcification (3,4), which in turn may contribute to increased aortic stiffness. The pressure wave speed is directly related to the elastic modulus of the arterial wall according to the Moens–Korteweg equation, and carotid-femoral pulse wave velocity (PWV) is considered the gold standard method for assessing aortic stiffness (5). A high PWV causes an earlier return of peripherally reflected pressure waves, which increases the cardiac workload by augmentation of the central pulse pressure. The Calcification Outcome in Renal Disease (CORD) study prospectively evaluated the predictive value of abdominal aortic calcification (AAC), arterial stiffness (PWV), and wave reflection for the occurrence of CV events and mortality in dialysis patients. This multicenter study was designed to reflect daily clinical practice and therefore used low-cost resources and widely available methodology with a minimal burden for patients and physicians. The aim of the analysis presented here was to evaluate whether radiographically measured aortic calcification and central PWV could provide additional complementary predictive value for all-cause mortality or the occurrence of a first nonfatal CV event. Patients aged 18 years or older and treated by maintenance hemodialysis (HD) or peritoneal dialysis (PD) for at least 3 months were enrolled at 47 European dialysis centers after selection by a computer algorithm. This algorithm ensured the inclusion of a representative sample of all prevalent patients screened at the start of the study with regard to age, gender, time on dialysis, diabetes, and smoking status. Exclusion criteria were conditions making arterial measurements technically impossible or unreliable (cardiac arrhythmias, amputations, severe peripheral vascular lesions) and a life expectancy of <6 months. The ethics committee at each participating center approved the study and all patients gave written informed consent. Calcification was assessed by semiquantitative scoring of a plain lateral lumbar radiograph (AAC scores) according to a previously validated method (6). All radiographs were collected for central reading and scored by two investigators (one for the Nordic countries and one for Belgium and The Netherlands) who were blinded to the patient data. Because optimal cutoff values of AAC scores for predicting outcome in dialysis patients were unknown, the scores were categorized into tertiles, consistent with the approach used by Wilson and coworkers (7). In the cohort presented here, this corresponded to scores of ≤4 (no or minor calcification), 5 to 15 (moderate calcification), or ≥16 (heavy calcification). Hemodynamic measurements were performed in the supine position by trained research nurses, technicians, or study physicians and before a HD session or after drainage of the abdominal cavity in PD patients. PWV was obtained by sequential recording of electrocardiogram-gated carotid and femoral artery pressure waves using applanation tonometry (SphygmoCor version 7, AtCor Medical, Sydney, Australia). The path length was calculated by subtracting the distance between sternal notch and carotid recording site from the distance between sternal notch and femoral site. PWV was calculated as the path length divided by transit time (m/s). Patients were followed prospectively for the occurrence of nonfatal CV events or death from any cause, whichever came first. Nonfatal CV events were defined as myocardial infarction, coronary revascularization procedures, stroke, or transient ischemic attack. When multiple events occurred in the same patient, only the time to the first event was analyzed. Differences in risk factors between patients with and without an event were tested using the χ2 statistic for discrete variables and the t test or the Wilcoxon rank-sum test for continuous variables, depending on the distribution. Kaplan–Meier cumulative-event curves according to tertiles of AAC scores and PWV were constructed to describe the frequency of events according to time since baseline measurements and compared by the Mantel (log-rank) test. HRs were calculated using Cox proportional hazards models to estimate the relationship of AAC scores and PWV with outcome. PWV was analyzed as a continuous variable and AAC scores in groups of tertiles. An interaction was tested for AAC scores with PWV on the basis of the prevailing hypothesis that calcification contributes to arterial stiffness, thus potentially limiting their ability to independently predict outcome at higher levels of calcification. The statistical significance of the interaction was estimated by means of the likelihood-ratio test to assess the effect of removing the interaction term. After forcing AAC score, PWV, and age into the model, we allowed any of the following variables to enter the model in a stepwise forward selection procedure based on the likelihood-ratio test: gender, race, current smoking status, diabetes, dialysis modality (HD or PD), time on dialysis, body mass index, mean arterial pressure, treatment with an angiotensin converting enzyme inhibitor or angiotensin receptor blocker, treatment with a statin, treatment with phosphate binders (none, calcium-containing or noncalcium containing) and serum levels of hemoglobin, albumin, calcium corrected for albumin, phosphate, calcium-phosphorus product, ln(parathyroid hormone), ln(C-reactive protein), ln(triglycerides), total cholesterol, HDL cholesterol, and LDL cholesterol. We chose not to include history of CV disease as a covariate in the stepwise statistical modeling procedure because of several reasons: (1) the main interest was not to establish an optimal mathematical prediction model but to identify factors that may be causally related to outcome and/or may be modified by treatment; (2) history of CV disease is a crude dichotomous measure that lacks any information on type and number of events, as well as their time-relation to the start of the study; (3) finally, the validity of a statistical model that includes a variable that is a predictor and outcome measure at the same time may be questioned. Nevertheless, univariate (stratified) Kaplan–Meier and multivariate Cox regression analyses were repeated with CV disease history included to verify the consistency of our conclusions. The validity of the proportionality assumption was verified by analysis of the scaled Schoenfeld residuals using S-PLUS, version 6.1. The other statistical analyses were performed with SPSS, version 15. All P values are two-tailed, and 95 percent confidence intervals were calculated. From January 1, 2004 to June 30, 2005, 1084 patients were enrolled, of whom 17 (1.6%) had incomplete data, leaving 1076 patients included in the analysis presented here. After a median follow-up of 2 years, 234 deaths and 91 nonfatal CV events were recorded. Details on numbers of events are displayed in Table 1. Table 2 shows the hemodynamic parameters and characteristics of patients with and without events. Absolute 2-year risks according to the joint distribution of tertiles of AAC and PWV (Figure 1) indicate that the additional prognostic value of one measure is dependent of the level of the other. Unadjusted Kaplan–Meier cumulative-event curves according to tertiles of AAC scores and PWV are displayed in Figure 2. Differences among these curves were statistically significant (P < 0.001) for both measures. Two-year risk of death or nonfatal CV event according to tertiles of PWV and AAC. Unadjusted Kaplan–Meier cumulative-event curves for all-cause mortality and first nonfatal CV event according to tertiles of (A) AAC scores and (B) PWV. The differences among all curves were statistically significant (P < 0.001). Figure 3 displays the age-adjusted hazard ratios (HRs) associated with higher tertiles of AAC scores (Figure 3A) and PWV (Figure 3B). Table 3 shows the independent effects of AAC scores and PWV according to the Cox regression model, adjusted for age and for the effect of diabetes and lower serum albumin as additional significant covariates retained in the stepwise regression procedure. Calcification had a major effect with a >8-fold increase in HR for AAC scores in the highest compared with the lowest tertile. In addition, for each 1-m/s increase in PWV, the HR increased by 1.15%. The effect of PWV was weaker in the middle and upper tertiles of AAC scores compared with the lowest tertile, as indicated by the negative coefficients for the PWV by AAC score interactions. Figure 4 illustrates the difference in survival between patients with a PWV >12 m/s versus a PWV <8.8 m/s for patients with minimal and severe calcification, indicating effect modification. The largest difference in survival according to PWV is observed in patients with an AAC score <5. Outcome was not influenced by gender or race. Age-adjusted HRs associated with higher tertiles of (A) AAC scores and (B) PWV. Unadjusted Kaplan–Meier cumulative-event curves according to upper and lower tertiles of PWV and AAC scores. The black and gray lines represent patients with AAC scores <5 (lowest tertile) and >15 (highest tertile), respectively. The solid and dotted lines represent the patients with a PWV in the lowest and highest tertiles, respectively. The differences among groups of PWV and AAC scores were statistically significant (P < 0.001). Including CV disease history in the univariate (stratified) Kaplan–Meier and multivariate Cox regression analyses only affected the estimated effect size of calcification due to a high degree of collinearity with AAC score, but it did not change the overall conclusions (data not shown). Whereas calcification and PWV each individually have been shown to be predictive of outcome, their combined independent predictive value for the occurrence of CV events and mortality has never been investigated. In the study presented here, it has been shown that PWV retained its predictive value, independent of the degree of calcification. The complementary prognostic information provided by these simple investigations is of major importance for identifying subpopulations that may benefit from a specific intervention and for the design of future randomized trials in patients with chronic kidney disease. Recent studies have demonstrated that brachial pulse pressure, a proxy of arterial stiffness, is an important parameter to take into account when deciding on fluid removal and dry weight (8,9). For the management of hyperphosphatemia, the choice of phosphate binder (calcium- versus noncalcium-containing) may be influenced by the degree of vascular calcification, if the available data on the adverse effect of calcium salts on the progression of vascular calcification and outcome are confirmed (10–12). The detection of increased values of these surrogate markers may also be extremely valuable in apparently low-risk patients and/or those enlisted for renal transplantation. Therefore, calcification status and central arterial stiffness should be considered for inclusion in routine clinical practice to assess CV risk in dialysis patients. Although calcification and stiffness had additive prognostic value, their mutual contribution varied according to the level of calcification: the risk associated with each 1-m/s increase in PWV was less pronounced in patients with moderate to severe calcification. This effect of modification of calcification status on PWV could be because in heavily calcified patients, calcium deposits will also be localized in the medial layer of the vascular wall, thus contributing to an increased stiffness. Conversely, patients without or with only minor calcification still can have stiff arteries because of other mechanisms, including an increased collagen content in the vessel wall (13), accumulation of advanced glycation end products in diabetes (14), and endothelial dysfunction (15). Another explanation may be that PWV values are underestimated at higher levels of calcification because of an inaccurate path length estimation because of aortic tortuosity, a situation that could occur more frequently in heavily calcified patients. However, in this case, our conclusions regarding the importance of combined measurement of PWV and AAC scores would only be reinforced because a normal value of one parameter does not exclude an increased value of the other. Our data confirm the results of earlier studies that showed the independent predictive value of PWV (2) and arterial calcifications (12,16) for outcome in dialysis patients. However, the cohort presented here was approximately 4 times larger and included HD and PD patients, which allowed for the extrapolation of the findings to the average European dialysis population. As in the milestone paper on the effect of PWV on survival (2), in the study presented here the predictive value of PWV was also independent of age and serum albumin. In contrast, we did not find a significant independent effect of hemoglobin or diastolic blood pressure. This may be due to several factors. Our cohort is more recent than that of Blacher et al., which started in 1987 (2). Consequently, progress in dialysis care, pharmacologic treatment, and medical care in general may have influenced the relative importance of other risk factors. We had supplementary information on calcification and used a combined endpoint that also included nonfatal CV events in addition to mortality. Finally, our population was approximately 10 years older and included more patients with diabetes, both independent risk factors for outcome. The dramatic increase in the risk of CV events or death associated with calcification is in line with recent publications on the prognostic effect of coronary artery calcification (CAC) (12,17). As for CAC scores, event rates approximately doubled per tertile increase in AAC score. However, in contrast to computed tomography-based methods, which remain the gold standard for quantification, a plain lateral lumbar x-ray is far less expensive and readily available. Moreover, a recent study demonstrated that abdominal x-ray scoring had a very good discriminatory value compared with CAC scores, with an area under curve of the receiver-operating characteristic >0.70 at each CAC threshold (18). The prognostic value of aortic calcification has been demonstrated previously in the general population using the same technique (7). Recently, CAC scores were shown to contribute to the risk of coronary events over and above traditional risk factors, independently of racial or ethnic group (19). Similarly, in our study AAC scores remained predictive of outcome even after accounting for age, diabetes, and serum albumin as a typical risk factor in dialysis populations. Dialysis patients are an extremely heterogeneous population and subject to continuous changes in dialysis practice patterns and transplantation, which may be one of the reasons why interventional trials have so far been disappointing. Therefore, we should probably focus our efforts on subgroups that actually may benefit from interventions. The CORD study is the first to implement in daily clinical practice two simple and inexpensive tools that have complementary value in predicting risk. The study presented here has some limitations. We studied prevalent patients in a European dialysis population. Therefore, one should be cautious in extrapolating the results to incident patients or to non-European dialysis populations who include more non-Caucasian ethnic groups and/or have other risk factor profiles as shown in the Dialysis Outcomes and Practice Pattern Study (20). The follow-up period of 2 years was relatively short. However, many patients included and the high event rates compensated for this. Despite the stratified inclusion software algorithm, the selection of patients might have been somewhat biased by the preference of the recruiting physician. Such a favorable selection bias would imply that the actual risks are underestimated. Finally, this was an observational study so that treatment effects could not be evaluated. The strength of the CORD study is that it is the first to demonstrate in a multicenter trial that combined measurement of aortic calcification and central arterial stiffness is feasible in routine daily clinical practice and strongly predicts adverse outcome. 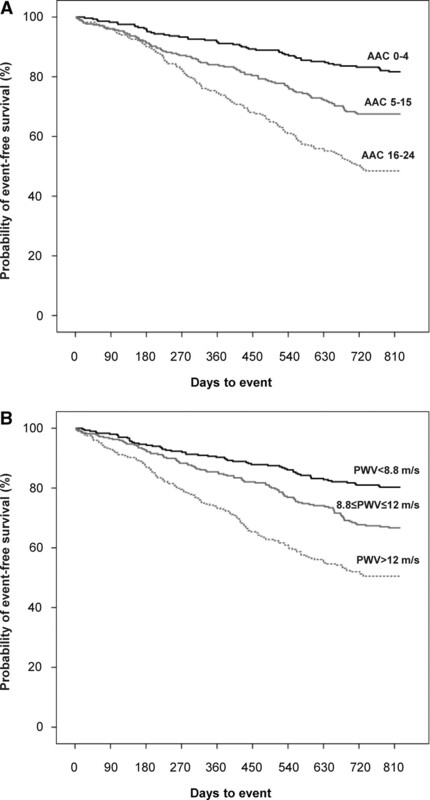 AAC scores and carotid-femoral PWV provide mutually independent predictive information for the occurrence of CV events and mortality in patients treated with HD or PD and may help to identify patients at high risk. These measures can be obtained rapidly, cause little discomfort to the patient, are inexpensive, and have the potential for a wide availability, which makes them ideal candidates for implementation in daily clinical practice. Hopefully, targeted interventions with a favorable effect on these parameters will also be translated into a survival benefit. E.H. and F.V. have served as consultants to Genzyme. E.H., B.W., P.L.R., J.-M.K., F.V., P.B.J., R.V., and W.V.B. have acted as study investigators funded by Genzyme. M.R. is an employee of Genzyme. The CORD study was sponsored by Genzyme.